This summer, we let urban vibes inspire and carry us away. To escape from the demands and stresses of everyday life, we're following you into the urban jungle and the hidden cosmopolitan oases. 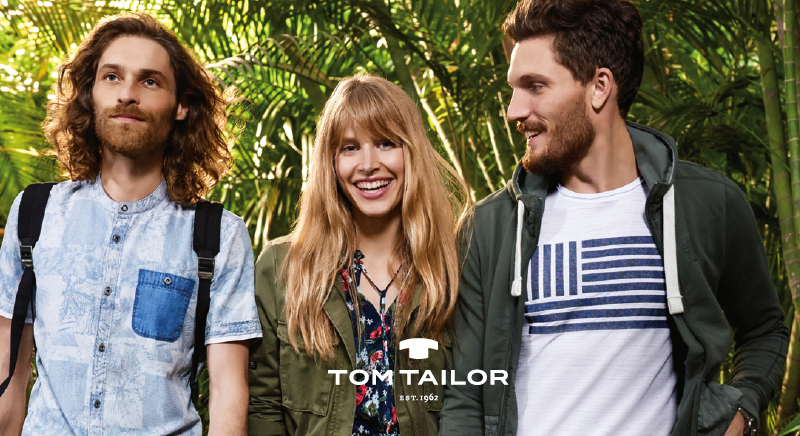 TOM TAILOR is getting ready for anything the city demands, for any fashion occasion. With uncomplicated looks, exciting contrasts and intricate details, the spring/summer collections bring feel-good moments to our hectic daily lives and turn the summer into an unforgettable experience. She is wearing an airy midi-dress with a floral print. The military jacket in olive green with embroidered accents creates a masculine counterbalance. This season is all about contrasts. Victorian lace meets robust military elements, while casual denims with patches pair with delicate, embroidered blouses. He is wearing cargo shorts, a casual t-shirt with a graphic print and a faded sweat-jacket in dark green. This is combined with white sneakers. The focus is on casual styling with sporty, functional details. Stripes are an absolute must-have this season. Follow us this season as we follow you through your urban jungle. Where is your oasis?